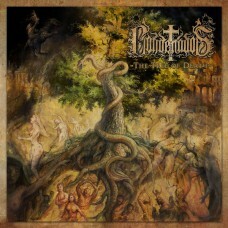 It's been five long years since CONDENADOS' cult debut album for SHADOW KINGDOM RECORDS, A Painful Journey Into Nihil, but at long last, the wait is over: the Chilean doom-lords return with their highly anticipated second album, The Tree of Death! For over a decade now, CONDENADOS have been expertly crafting ancient, '80s-style European DOOM METAL that's proud and pure, poignant and provocative, and everything that made A Painful Journey Into Nihil a scene classic is amplified here on The Tree of Death. The lumbering grooves, the transcendent lead work, the emotive vocals, even a newfound swagger, and just the consistently bursting energy across their forlorn stomp...CONDENADOS are reverential of the form, but masters all the same. As such, The Tree of Death is very likely to appeal to fans of classic Candlemass, old Cathedral, the UK's Solstice, compatriots Procession, and even those who worship Bathory's Viking era. And at six songs in a swift 35 minutes, CONDENADOS succinctly make their point and compel repeat spins of The Tree of Death. Musically and aesthetically, The Tree of Death has strong symbolic art that manifests the most basic instincts of human beings, lyrically channeled through Goetia’s demonology. The cover art was crafted by esteemed Italian artist Paolo Girardi, who has worked with such bands as MANILLA ROAD, Inquisition, Cauchemar, and Blasphemophager among others. The artwork for The Tree of Death is already being acclaimed across social media networks as one of the most incredible works done by Girardi. Simultaneously with the album's release, CONDENADOS will reveal a video for "Demon's Head," whose theme will address the adverse effects of playing with black magic without having the knowledge of the art.